My boys absolutely love to go camping. Spending the night in the woods, cooking over a fire, telling spine-tingling stories in the dark—what more could a boy want? If you’re a mom like me, you might think this all sounds fine on the surface, but the reality of SPENDING ALL NIGHT IN THE WOODS, choking down burnt quesadillas, and having your teens scare the pants off your toddler with tales of lost Leonard might not bring out the same enthusiasm in you. Yes, there are bugs, and critters, and dirt, and spiders, and dirt, and did I say bugs and spiders? But, camping can be a really fun and educational experience with a little advance planning. 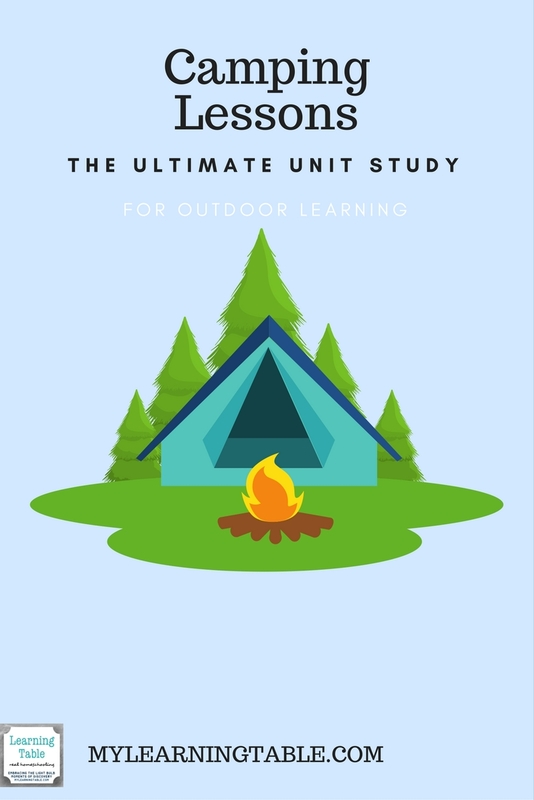 Camping is the ultimate unit study opportunity, and it is far more than a proving ground for practicing survival skills. After several camping trips with our kids, my husband and I learned to pare down our supplies to the essentials. The less stuff we have to haul and unpack, the easier it is to set up camp. As tent campers, everything must fit in our car, and the tent itself and sleeping bags take up a good bit of space. We like to stow everything in plastic storage bins with snap-on lids. They keep things dry if it rains, are fairly critter-proof, easy to pack ahead and store, and do double duty as a kitchen sink, a laundry basket, a baby bathtub, a foot-washing station, a footstool, or a bedside table. As for destinations, with young kids, it’s good to start off with places fairly close to home. We like to camp at state parks, because in addition to being affordable, the ones we have been to have restrooms with showers, hiking trails, canoe rentals, paddle boats, swimming areas, wildlife education, and a family-friendly environment. Being close to home was a life saver when two of our kids came down with a virus in the middle of the night on one trip and when a torrential rain storm washed us out on another. Nature study ideas: Study nighttime critters—we’ve been visited by curious raccoons and graceful luna moths. Being outside in the wee hours gives you opportunities to observe creatures and hear sounds you don’t get to experience from home. I pack a few field guides and notebooks for each of my kids, along with some pencils, and they enjoy exploring the campsite by flashlight. History ideas: Do a little advance research with a quick Internet search to learn more about the history of the area in which you will be staying. You might discover that a famous person hiked the trails or Native Americans set up camp alongside the creek. These true-life stories make great campfire tales, and can tie in to what you’re already learning about in history at home. My kids were enchanted to hear about the Cherokee who lived in the area, and I found a library book of Cherokee tales to read from at camp. Art and Crafts: Camp crafts are a must to keep kids occupied during downtime. My kids have personalized cigar boxes with stickers to create nature boxes, stamped leather bracelets, made bark and leaf rubbings, and made twig picture frames. My Pinterest fail moment was the time we tried to make animals out of pipe cleaners, which would have actually required the use of a professional artist and a glue gun to resemble anything other than a stick figure. It was an anti-Martha moment, and I learned to keep it simple after that. Basic supplies, such as leather crafting kits, glue sticks, crayons, and paper can be stored in a small container and placed out on the picnic table for inspiration. Survival Skills: Learn how to recognize poisonous plants, use a compass, safely build a fire, and observe trail safety. Team kids up using a buddy system to help keep track of everyone. Have everyone pack their clothes and personal items in a backpack, which can be emptied in the tent and used to carry trail supplies for hiking. Make sure they have more than a pack of peanut butter crackers and a juice pouch before trekking to the waterfall, which might end up being thirteen miles away (don’t ask how I know). Family togetherness takes on a whole new meaning when you’re all piled into a tent for the night, but the memories you make are priceless. Just keep it simple, plan ahead for fun, and remember to zip the tent up tight to fend off the spiders. It’s worth it! We love camping with our kids,especially during the fall months. IT’s a great way to get outside and spend quality time without all the other distractions. We’ve made many special memories camping with our kids 🙂 thanks for sharing your tips and ideas! Some good ideas to help make camping a more positive experience for those who say “what are we going to do all day?” I think it helps make it more concrete to give people some specific ideas! Down time is great, but my boys often like to have a little structured time as well. It’s fun to turn outings into learning experiences. So excited to see this post, we love to camp. Our family also, well the girls except for family camp events, participate in an American Heritage Girls Troop and these are some of the exact reasons we plan camping trips for the girls!